Son of John and Anne McLeod, of 6, Carloway, Stornoway. 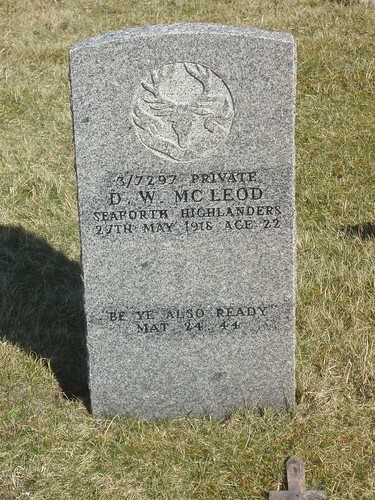 It is with deep regret we have to record the death of Donald William Macleod, son of John Macleod, 6 Carloway, which took place on 27 May 1918. DW, as he was generally known, was mobilised with the Seaforths Special Reserves, at the outbreak of war and went over to France in October 1914 and was severely wounded in 1915. Thereafter, he was discharged. He was a bright, cheery lad, always kind and considerate. His death, at the early age of 21, is a great blow to his parents and brothers, to whom the sincere sympathy of the whole community is extended in their great sorrow and sore bereavement.